Alloui N., Ben Aksa S., Alloui M.N., Ibrir F.
J. World's Poult. Res. 2(2): 25-27., 2012. ABSTRACT: The aim of the experiment was to compare the production performance of broiler chickens when fed a conventional standard feed and the same feed supplemented with Fenugreek seeds. One hundred and twenty (120) a-day old male broiler chicks of the strain ISA-15, were divided into 2 equal groups; a control group (A) and an experimental group (B), with six replicates of 10 chicks each per group (6×10) in a completely randomized design. The control group received a classic feed based on maize and soybean meal and the experimental group was fed with the same control feed without antibiotic and coccidiostatic and supplemented with Fenugreek seeds at (3g/kg of feed). Fenugreek seeds supplementation significantly (p0.05) for the slaughters parameters (dressing percentage, carcass length) and mortality. J. World's Poult. Res. 2(2): 28-32. 2012. ABSTRACT: Meat type Japanese quail were subjected to three different methods of individual phenotypic selection viz., high two week body weight, four week body weight and high four week body weight coupled with low relative body weight gain between 4-6 weeks of age for three generations. The lines, generations, sexes and hatches had significant (P0), the least squares means of body weights at hatch,1,2,3,4,5 and six weeks of age were 8.31±0.04, 38.53±0.29, 82.72±0.60, 120.13±0.74, 148.34 ±0.85, 173.15±0.89 and 191.15±1.04 g, respectively. The corresponding means were 8.04±0.04, 38.84±0.30, 77.51±0.61, 110.71±0.75, 144.77±0.86, 170.27±0.90 and 190.81±1.06 g in first generation (S1); 8.93±0.04, 41.41±0.28, 78.81±0.58, 128.68±0.71, 165.83±0.82, 184.27±0.86 and 202.84 g in second generation (S2) and 8.42 ± 0.04, 39.73±0.26, 78.17±0.53, 123.86±0.65, 160.75±0.76, 183.53±0.79 and 202.59±0.93 g, in third generation (S3). The least squares means of body weights of males at hatch, 1, 2,3,4,5 and 6 weeks of age were 8.41±0.04, 39.32±0.26, 78.47±0.54, 118.72±0.66, 150.81±0.76, 169.87 ± 0.80 and 183.42±0.94 g, respectivelyÂ and in females in the same were 8.44±0.04, 39.94±0.26, 80.14±0.52, 122.97±0.65, 159.04±0.75, 185.73±0.78 and 210.28±0.92 g, respectively. Mohammed MH, Hair-Bejo M, Omar AR, Hasoon MF, Alazawy A, Abdul Ahad EA and Aini I.
J. World's Poult. Res. 2(2): 33-36., 2012. ABSTRACT: The susceptibility of the chicken mesenchymal stem cells to infectious bronchitis virus was characterized after twenty consecutive passages in chicken mesenchymal stemm cells. Virus replication was monitored by cytopathic observation, indirect immunoperoxidase, and reverse transcription polymerase chain reaction. At 72 h post-infection (p.i.) in third passage, the cytopathic effect was characterized by rounding up of cell, monolayer detachment, intracytoplasmic brownish colouration was readily observed by from 24h p.i in third passage, and at all times the extracted viral RNA from IBV-infected monolayers was demonstrated by reverse transcription polymerase chain reaction. Tissue culture effective dose50 was used to measure virus titration performed on chicken mesenchymal stem cells and the titres in twenty passages was 108.6 TID50/ml. 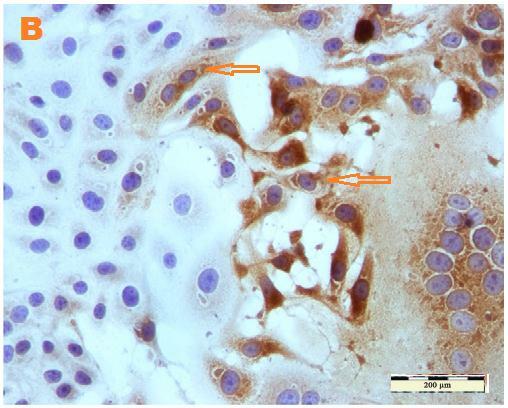 The results obtained in this study suggested that the chicken mesenhymal stem cells can be used for adaptation IBV and may be considered a step forward for the use of these cells in the future for IBV vaccine production. Sellaoui S, Alloui N, Mehenaoui S. and Djaaba S.
J. World's Poult. Res. 2(2): 37-39., 2012. Keywords: Algeria, bursa of Fabricius, chicken, lesion score.